Your system for strategic advising. The software, the method, and the guidelines for you to deliver advisory services efficiently and profitably. Get started: Produce a dashboard and financial forecast in under 90 seconds! Automate everything! LivePlan automatically syncs with your accounting software, maps to the chart of accounts, and creates dashboard reports and financial forecasts with 3 years of data. You can start sharing powerful reports with clients immediately. Connect with your client and show your value using LivePlan&apos;s powerful small business features. The Kick Off is an important step. It&apos;s a chance to connect with your client, learn their business model, understand the problems they need to solve, and hear their long-term goals. If done correctly at the beginning, you won&apos;t have to repeat this every month—which is one of the keys to creating a scalable advising practice. Use our resource guide to help point you in the right direction. Advise with confidence using LivePlan&apos;s step-by-step outline for strategic planning. Conduct a Lean Planning meeting with your client, gathering all the details necessary to create a strategic plan using LivePlan&apos;s Pitch feature and our Planning Meeting Resource Guide. Do this one time the right way, and you won&apos;t have to start over each month with your client. It&apos;s scalable. Financial forecasting is easy with LivePlan—build your client&apos;s forecast in minutes. Build a smart financial roadmap for your client using the 3-year automated forecast and the knowledge you gained in the planning meeting. LivePlan&apos;s built-in benchmarks and forecasting wizards will guide you. Advise strategically every month, using a value-based pricing system. 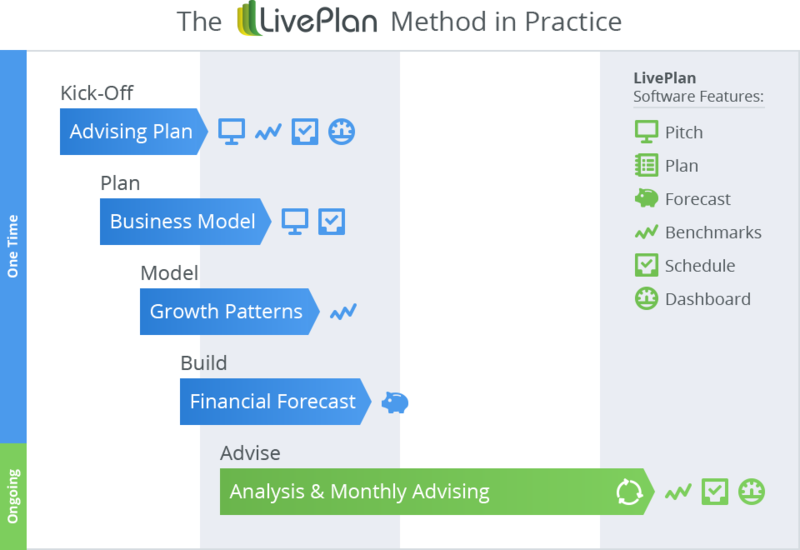 Conduct a monthly Strategic Advising meeting with your client, using LivePlan&apos;s Dashboard reports and our Advisory Meeting Resource Guide. Compare forecast to actuals, look at trends, uncover problems, and guide solutions—it&apos;s what being a Strategic Advisor is all about! Ready to build a scalable, efficient, and profitable client advisory practice with LivePlan?